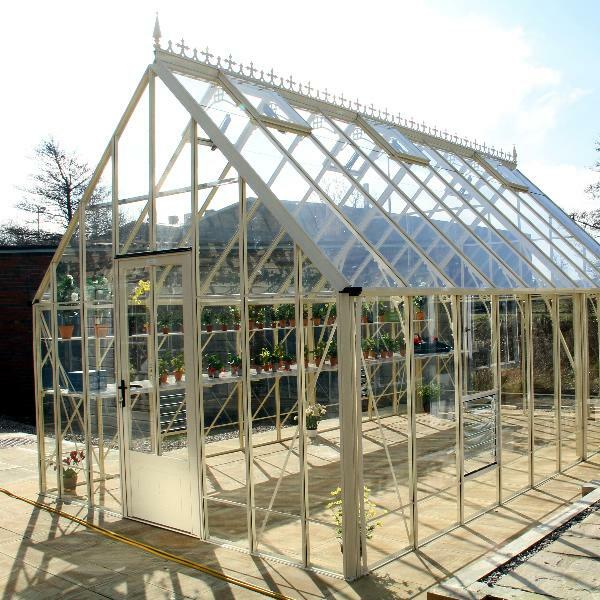 The Robinsons Reigate Victorian greenhouse is part of the Robinsons Victorian range of greenhouses. This model is 11' 7" wide and is a freestanding, glass-to-ground building. The Robinsons Victorian range offers you a choice of greenhouses with a distinctive Victorian style. The addition of cast aluminium spandrels at both eaves and ridge strengthens the greenhouse considerably and the extra height (created by the more traditional 45 degree pitch to the roof) gives more air in the greenhouse as well as more room for specimen plants. The 45 degree roof pitch is also said to be better for light transmission as well. 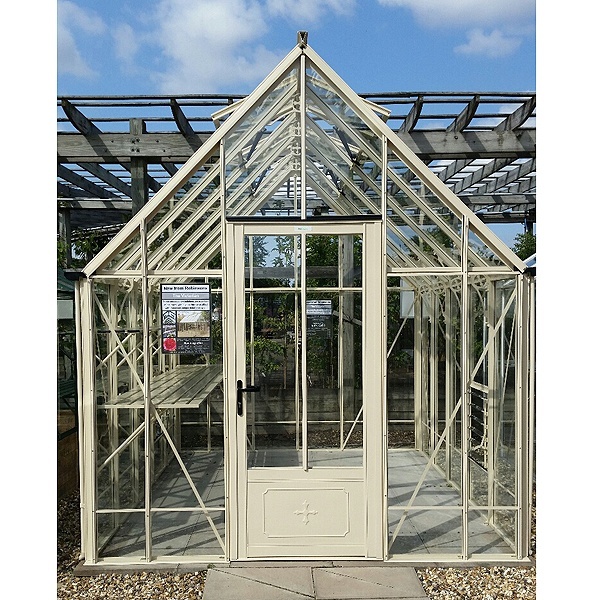 The Robinsons Reigate Victorian greenhouse has high eaves (5' 6") for extra headroom inside your greenhouse. Extremely strong 'box section' glazing bars, toughened safety glass, guttering and downpipes, automatically opening roof vents and screw-in bar capping are all included as standard. What's Included with your Robinsons Reigate? 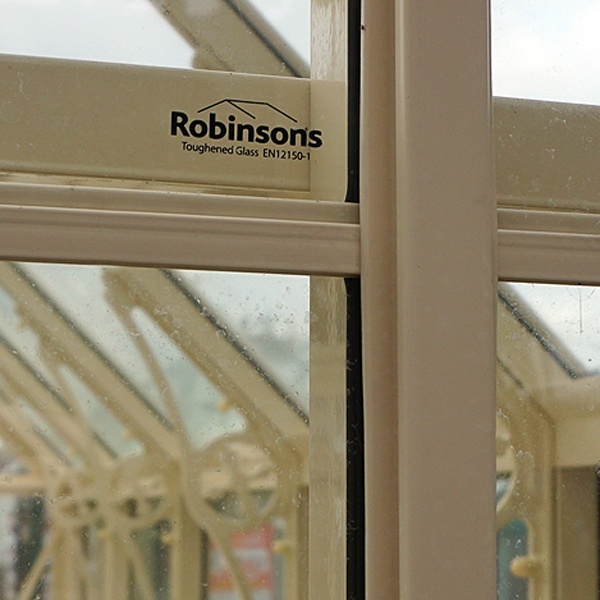 R-PRO glazing bars are made using the unique Robinsons Box Section technology. The sheer strength of the bars themselves means that we do not need to clutter up the inside of the greenhouse with messy braces. As standard your greenhouse includes aluminium bar capping which holds in the glass firmer and stronger than other greenhouses. It is then finished with a strip to cover those screws for a high quality finish. 4mm toughened safety glass is supplied as standard for strength and safety. You now have the choice of 5 colour finishes as well as the plain mill finish for your greenhouse. Old Cottage Green, Pastel Sage, Anthracite and Ivory have been added to the existing range, joining Classic White. GO-LO is a properly engineered low level threshold for easy wheelchair or wheelbarrow access. At both the ridges and eaves, the Robinsons Reigate includes stylish Victorian Spandrels in an attractive design. Included is a slatted Louvre side vent which allows extra air flow into your greenhouse and really makes your plants flourish. Included as standard, these roof vents open automatically as the greenhouse warms up keeping your plants from overheating. Lockable sliding door with a low threshold to keep your produce secure. Extra high eaves for more headroom and plenty of growing space for those tall plants like tomatoes and Chrysanthemums. Your Robinsons greenhouse comes with a free 10-year frame guarantee. For that truly spectacular finish, add Victorian ridge cresting in an attractive coloured finish. Add 25" or 35" staging and 12" shelving for a practical and stylish upgrade. Use these brackets to hang baskets, without the need for an obtrusive rail. Add blinds to your greenhouse to create shade for your plants. Automatic openers can be fitted to the louvre vents, just set and forget! 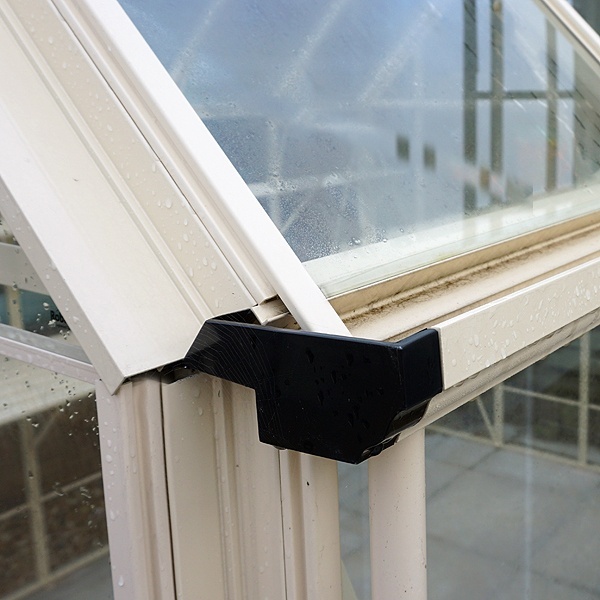 An additional automatic roof vent increases the flow of air through your Robinsons greenhouse, ideal for orchid houses or other specialist environments. Extra high eaves with a 45-degree roof for that stunning Victorian look. Add extra length to your greenhouses with an 8ft 1in extension. This is a truly awesome greenhouse... incredibly roomy, immensely strong, and remarkably good looking. 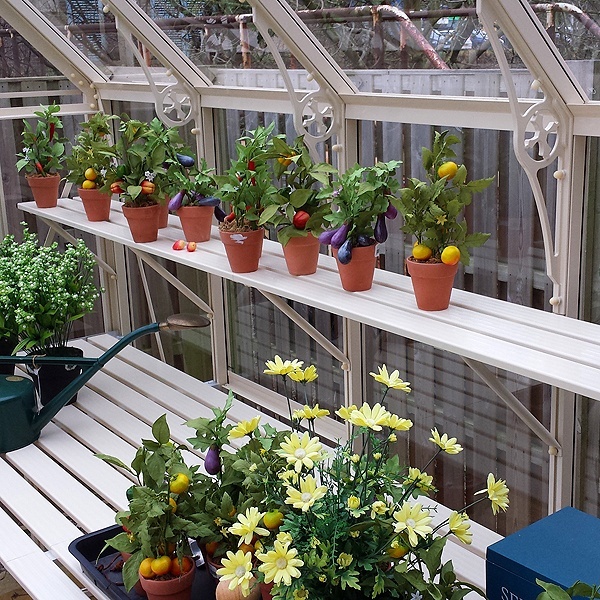 Pictured here with optional staging, shelving and ridge cresting it really is the ultimate in greenhouse design ! Carefully crafted spandrel bracing is used at the eaves and the ridge of the Robinsons Victorian greenhouses to provide strength and a touch of old time style to these beautiful greenhouses. Automatic openers are an essential fixture for each roof vent. A wax filled cylinder opens hydraulically as the air warms up and allows the heat to discharge through the vents. The opening temperature can be adjusted. For the 11'7" wide ( 3.54m ) wide Reigate and Roedean, 10 slat 35" staging. This photo also shows the eaves spandrels to good effect. 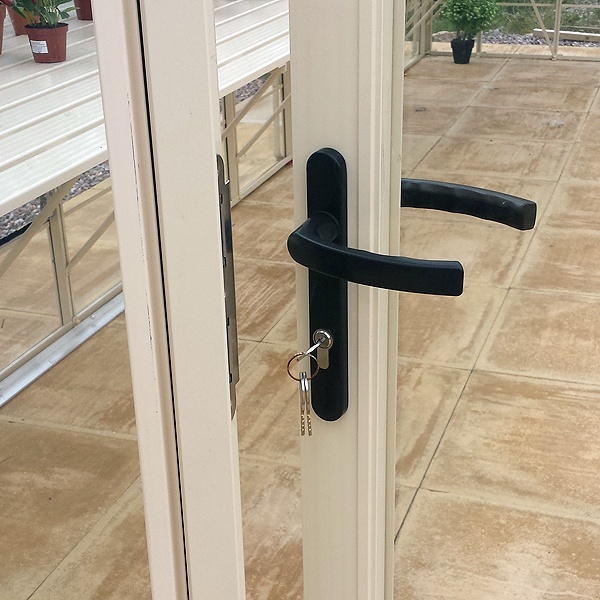 A secure locking hinged door with low threshold is a standard feature of the Victorian range. When something as good as the Robinsons Victorian comes along we're keen to show it to you as soon as we can so we have begun ( September 2014 ) a programme of installations at our 33 branches. If the model you're looking for isn't on display near you, just call one of our branches and we'll let you know if there's a different model in the range locally which will demonstrate all of the product features even if it's a slightly wider or narrower building ! Pictured here is an Ivory finish, glass to ground ( as opposed to dwarf wall ) Ratcliffe display model at our Hertford branch. It features optional staging and shelving which is typical of all of our display models. 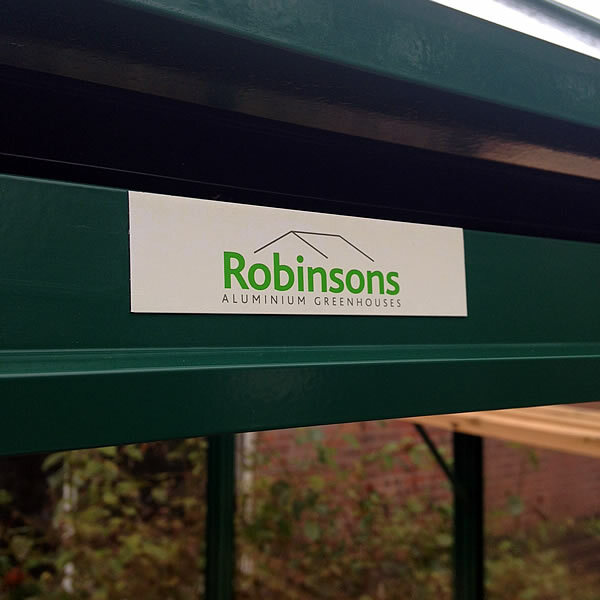 For over 60 years gardeners have valued Robinsons as the name on the very best aluminium greenhouses. GBC, established for over twenty five years, are the UKs largest supplier of Robinsons Greenhouses with displays at every one of our branches nationwide. All new Robinsons greenhouses carry a ten year frame guarantee. Toughened safety glass is included as standard with every Robinsons Victorian greenhouse for safety and also for ease of maintenance. 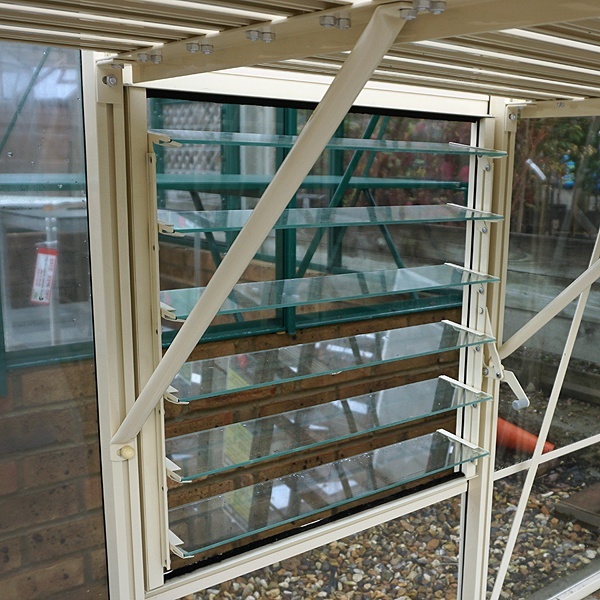 This is held in place by external bar capping strips : in the picture you will see that the edges of the glass are secured behind the capping strip meaning that it is virtually impossible for the wind to blow the glass out. It's also neat and easy to clean. The capping strip matches the colour of greenhouse you choose. 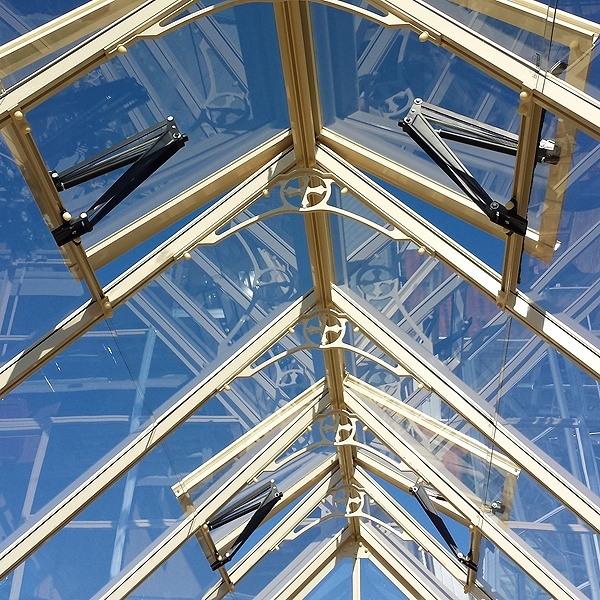 Louvre windows allow you to ventilate your greenhouse at low level thus moving stale air from around your plants and out through the roof vents. Robinsons Victorian louvres can even be fitted under the staging as shown ! If preferred you can also add an automatic louvre opener to do the job for you in hot weather ( not pictured ). Just to complete the Victorian look, crafted in true Robinsons Victorian style, this is an optional additional item available for you to consider. Our large range of Robinsons greenhouses all come delivered as standard by one of Robinsons own experienced drivers. Robinsons greenhouses are all delivered complete with full installation instructions and fittings. As with all of our buildings we always recommend that you provide a good level base prior to delivery. Our delivery times can vary from season to season, but typically you should expect to receive your building around 4-6 weeks from point of order. All of our buildings are made to order, so during the busy spring to summer seasons this may increase to 6-10 weeks, dependant on the building that you purchase. Please feel free to contact us on 0800 999 0123 to check our current delivery times. Where Can I See Robinsons Greenhouses?